The Sony VAIO E15 is as stylish a mainstream laptop as you're likely to find. Starting at only $500 with a 15.5-inch screen and state-of-the-art ports and connectivity, it's an inexpensive way to impress your fellow humans with your astute judgment of things computing, as well as your fine taste in design. 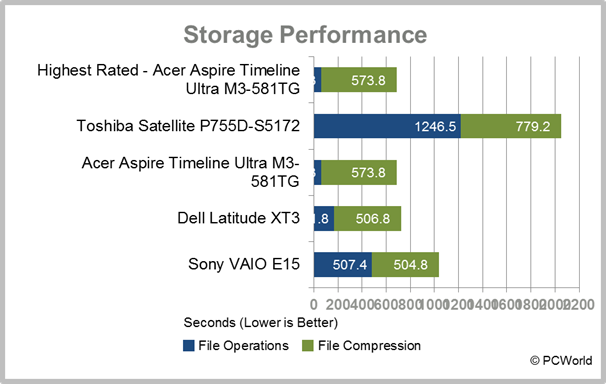 Though inexpensive in its least formidable configuration—which sports an Intel Pentium B970 CPU—the VAIO E15 may be configured with faster stuff up to about $1350 (Core i7). Our "nicely configured" $700 test unit has a Core i5-3210M CPU, 6GB of system memory, a CD/DVD burner, and a 5400-rpm, 750GB hard drive. Options include a Blu-ray player, but sadly, no 7200-rpm hard drives or SSDs. It is most likely the slowish hard drive that held the E15 in check during our testing and hands-on. 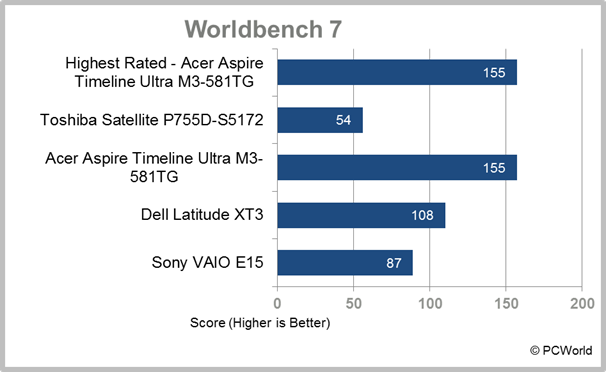 As the chart below suggests, a WorldBench 7 score of 87 is a little below average even for an affordable laptop, and its subjective feel (the speed of menus and windows opening, icons being drawn, and so on) is slightly sluggish until Windows has cached icons and the like. On the other hand, 1080p video plays very smoothly, and sound through the speakers is more sonorous than with most laptops, which is to say, it’s not grating. The 1.3-megapixel webcam gives a nice image as well. Gaming frame rates delivered by the integrated Intel HD 4000 graphics are generally playable up to the 15.5-inch display's maximum 1366 by 768 resolution, but only in low detail; tougher games will require you to knock said resolution down a notch or two. The AMD Radeon HD 7550M discrete GPU that's available for either $100 (1GB of dedicated memory) or $150 (2GB of memory) will improve frame rates tremendously. At 14.65 inches wide, 1.3 inches high, and 10 inches deep the VAIO E15 is a midsize laptop in every respect. It travels at 6.3 pounds (that includes the 0.9-pound AC adapter), and run time is an acceptable 4 hours, 14 minutes with the standard 4000mAh battery. You can increase that considerably (along with the weight) with the 5300mAh ($20) or 7950mAh ($100) batteries. Ports on the VAIO E15 are a modern mix and include a single always-on USB 3.0 port, three USB 2.0 ports, and VGA and HDMI outputs, as well as a Kensington lock port, headphone and microphone jacks, and a gigabit ethernet port. Bluetooth 4.0 and 802.11 b/g/n Wi-Fi round out the connectivity, and the front has SD and Memory Stick ProDuo card slots. The backlit, Chiclet-style keyboard recessed into the upper deck of the VAIO E15 is large, covering nearly the entire width of the laptop. The spacing and layout are top-notch, including the 10-key numeric keypad, though Sony has yet to emulate the magical "feel" of a Lenovo laptop. It's easy to set up a typing rhythm on the E15's keyboard, but the short key travel is apparent, and you'll never feel quite as secure on it as with a Lenovo. The one-piece rocker touchpad is responsive, perhaps too much so. I had a difficult time avoiding accidental taps and had to turn the feature off. Less clumsy individuals will probably be fine. Design flourishes include an Assist button that turns on the laptop and initiates the software recovery software, a Web button that does the same but with Windows and your favorite browser, and the Vaio button that launches the application of your choice. Sony loves to load software onto its laptops. Some of it is useful, powerful, and/or necessary such as the Arcsoft Webcam Suite, Cyberlink PowerDVD, and Sony's own ACID, Sound Forge Audio Studio, and Vegas Movie Studio HD Platinum 11. A lot of it such as the VAIO Gate launch application, VAIO Messenger, and VAIO Smart Network look nice but are really there to remind you which company's laptop you bought. Ditch the applets that duplicate functionality already present in the Windows 7 Home Premium operating system (Windows 7 Pro is an option), and it's remarkable how much quicker the E15 responds. Sony's laptops are always more than the sum of their parts—a sense of style will do that for you. 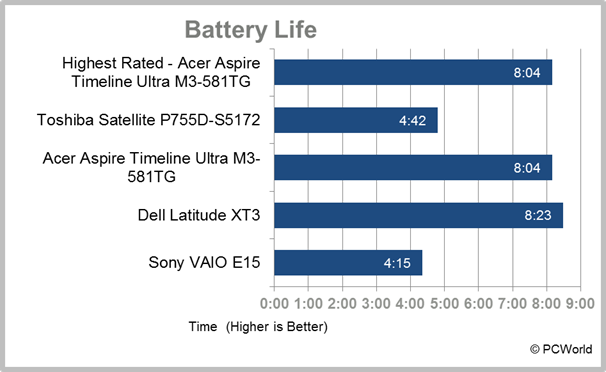 The VAIO E15 is no exception and will undoubtedly turn a lot of heads in the major electronics outlets. It's a great unit overall. Still, it would be even better if Sony offered a faster hard drive option. A sense of style raises this otherwise median mainstream laptop above the crowd.